TFAW's toy offerings is the primary source for revealing Mutos. Although there is still lots of speculation on what Mutos are and what they look like, the description of eight legs and wings has people guessing. Below we have the descriptions for TFAW's 5 different Godzilla 2014 toy offerings. We start with the two Muto combo packs, then the two godzilla figures and the adorable Chibi/anime-style pack that seems to support there are only two Mutos in the Godzilla 2014 movie. Bring the excitement of the all-new Godzilla movie home and fight for humanity as Godzilla, or be the Winged Muto and try to destroy the world! Your epic kaiju battles are sure to crumble cities and bring in the Air Force! Each pack features one figure, one destructible building, and one military aircraft. Exclusive Winged 3.5" Muto Is only available in this assortment. Blister card packaging. Bring the excitement of Legendary Pictures' Godzilla home with this deluxe 'Destruction Pack' featuring figures of Godzilla and the exclusive 8-legged Muto measuring 3.5". Set includes two kaiju, plus three destructible buildings & bridge, and five military vehicles. Widnow box packaging. With collector-level detailing, this large scale figure brings the new Godzilla to life as he blasts his powerful atomic breath and lets out his iconic roar! Figure measures approximately 10" tall, and features authentic sounds and 'atomic breath' action. Open box packaging. Bring the fight home as you control Godzilla in his fight against the Mutos! Choose from 'Tail-Strike' Godzilla with swinging tail manipulated via a chest control, or ' Thrash' Godzilla, whose devastating upper body attacks are activated through an upper-tail control lever! Open box packaging. Godzilla and the Mutos take on an anime-style look as these highly collectible chibi-style figures! Two different 2-Packs available, each with Godzilla in a different pose, and both Mutos. Window box packaging. 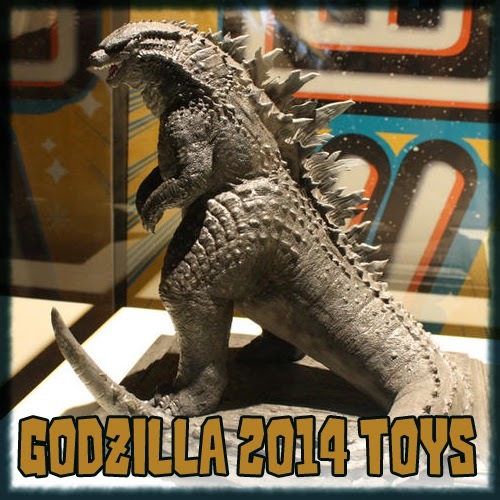 GODZILLA 2014 FIGURES AT www.monsterislandtoys.com in Chicago! Any and all pics of a new Godzilla for movie and figures have been very sad.I think it looks almost as bad as the 1998 American Godzilla,and that was bad for a Godzilla.It is only half way better.Don't like the head all that much,almost looks like he has no neck its so thick and fat,most all pics show he has crappy looking spins.I saw only one figure that did nit look to bad,but if its a model or toy I don't care,I see nothing that would make me want a new 2014 type.The best one I thought was the 2000 Godzilla it was the most believable in looks,had the most dinosaur style look.And they even had to screw with that look after two pics they narrowed the his jaws and brought down the front of his mouth giving the slightest look of beak a little that was in 02 or 03 they also slim the body to a little and changed the roughest under the neck.The slim down of the body could deal with all else from the 2000 Godzilla they should have left alone.Bring back the lite blue spines was find,Always thought that the flame color was go but should had him go through that to the blue,most likely if he had had trouble or gotten badly hurt somehow.But this is how I feel,not everyone likes the same zilla the best.There are others I care for 54,62,64,the ninety ones.As a matter of fact why I like the 2000 best is he really is the 1962 one just redone to the best with the skin and some looks of the 54 and ninety's thrown in.Go go forth and stomp city's and smash tanks and planes etc.No matter what one GODZILLA LIVES! You all have fun now.